Get ready because the strawberry recipes will start showing up all over Pinterest and your favorite blogs very soon…it’s strawberry season! 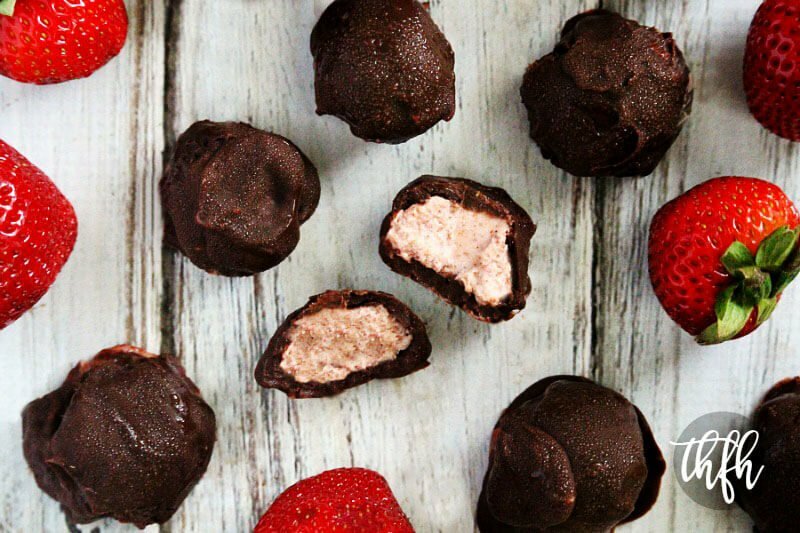 This Raw Vegan Strawberry Cream Chocolate Truffle recipe won the prize to be my first strawberry recipe this year. I bought my first flat of strawberries of the season from our Farmer’s Market at noon on Saturday and by dinner time on Sunday, the entire flat was gone…except 4 containers. However, I was able to sneak one container from two strawberry obsessed little boys to make this recipe! 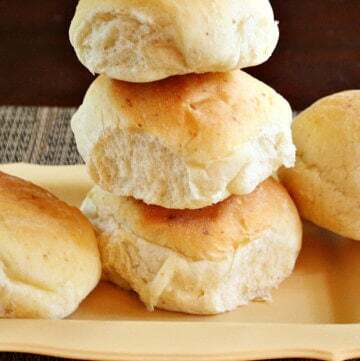 They’re super easy to make using basic ingredients you probably already have on hand. 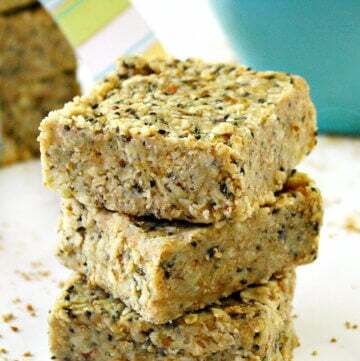 And, they’re raw, vegan, gluten-free, dairy-free, paleo-friendly and contain no refined sugar. Want more healthy dessert recipes? 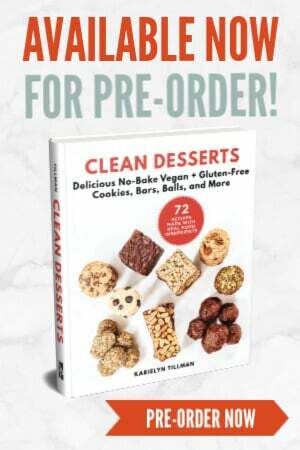 Check out my Pomegranate and Dried Blueberry Chocolate Bark, Chocolate Banana Cream Mini Desserts, Clean Eating Chocolate Crunch Bars or my Clean Eating Cookbook with an entire chapter of 20 healthy, clean eating dessert recipes you will love! Tip #1: If you don’t need this recipe to be 100% raw, you can use melted chocolate chips for the coating instead of making a raw version. Just add (1) cup of mini chocolate chips + (1) tablespoon of coconut oil to a small saucepan and melt on low heat, stirring the entire time to make sure it doesn’t burn. Just drop the truffles in one at a time and gently roll them into the melted chocolate until each one is completely covered. Step 1 Add all the ingredients for the cream filling to a food processor and process until smooth and creamy. Transfer the mixture to a freezer-safe container and put in the freezer for approximately 1 hour, or until it becomes firm and scoopable, but not hardened. Once the mixture is firm enough to scoop, remove from the freezer. Using a cookie scooper, take out one scoop at a time and place on a baking pan lined with parchment paper. If they aren't firm enough to roll into a ball shape, return the baking pan to the freezer for an additional 30 minutes. Step 2 Option #1 (raw): Add all the ingredients in the recipe for the chocolate coating to a small bowl and stir until it is smooth. Option #2: (not raw): Add (1) cup of mini chocolate chips + (1) tablespoon of coconut oil to a small saucepan and melt on low heat, stirring the entire time to make sure it doesn't burn. 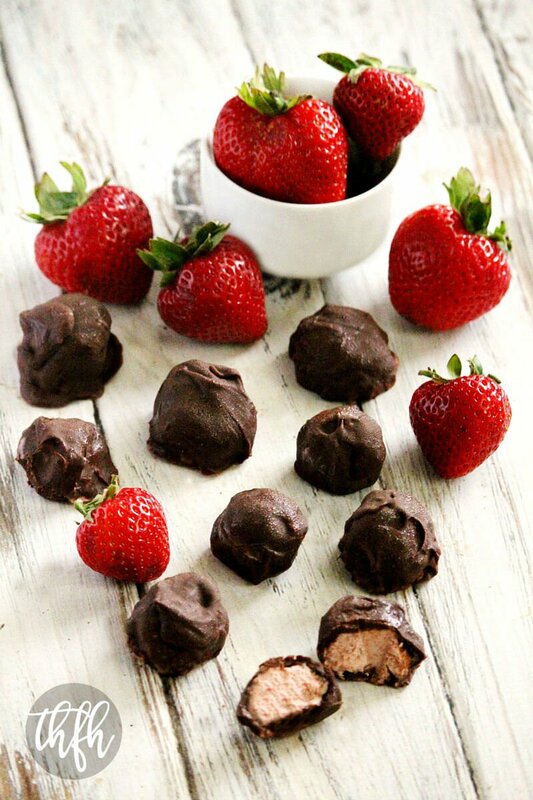 Step 3 Remove the strawberry truffles from the freezer and gently smooth them into a round ball shape. 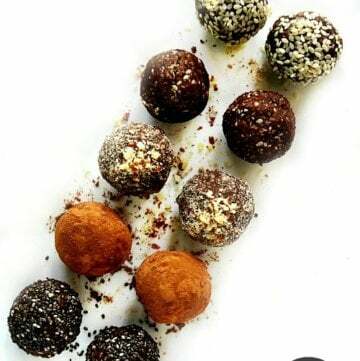 Drop each truffle into the whichever chocolate mixture you choose to make, and gently roll it until it's completely covered in chocolate. Remove and place back on the baking pan lined with parchment paper. Return to the freezer for approximately 15 - 30 minutes, or until the chocolate hardens. Remove prior to serving and store in the freezer because they will get soft and lose their shape if left out at room temperature. This recipe will make approximately (20) small truffles. The photographs for "Raw Vegan Strawberry Cream Chocolate Truffles" by Karielyn Tillman of The Healthy Family and Home website are licensed under a Creative Commons Attribution Non-Commercial 4.0 International License and cannot be used without my written permission. sad about the fact that im only seeing this NOW !!! in this recipe for the lemon juice it says 1/2. Does this mean tsp, TB, (doubt cup). If you could clarify I would greatly appreciate. Thank you . Hi there Laura! Sorry for the confusion in the recipe. It should be (1) tablespoon of lemon juice and I updated the recipe to reflect that. These are so decadent! Yum! Super easy to make as well. I cut the filling recipe in half and made 1/3 of the chocolate sauce. 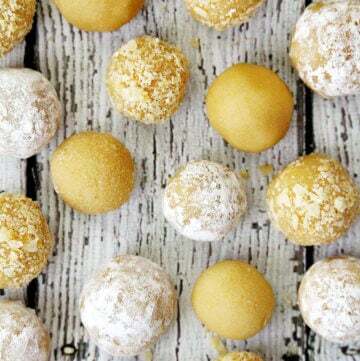 Came out with 15 gorgeous truffles (used the step-by-step freezer method). 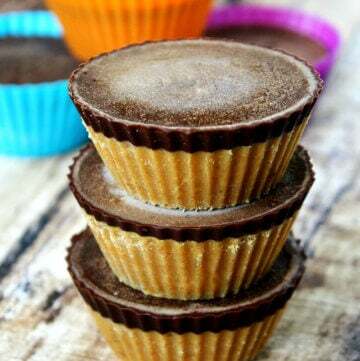 I love that these are so natural and easy to portion since they’re already bite sized and are kept in the freezer. Do you think other fruits would work the same as the strawberries? I have frozen mango that is calling my name! Can’t wait to share these with my parents! I’m a 19 year old vegan gal. They’re going to be blown away. Hi there Robin! I’m so glad to hear you enjoyed the truffles! Yes..I would ~definitely~ try other fruits and love the idea of using mango. There are so many different possibilities! 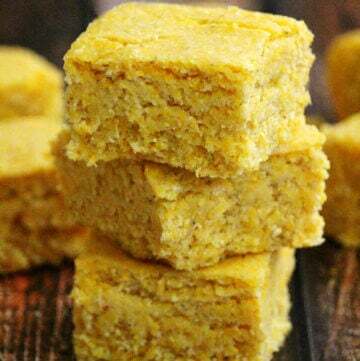 I also love to share healthy vegan foods with traditional food eaters to show them there are lots of yummy foods to make that are healthy and made with clean ingredients. And, I’ve got lots of other goodies on my site you might like too. These sound really good but I’m allergic to nuts. Could you reccomend anything I can use in place of the cashew butter? Hi there Aimee! I’ve never tried this before, but I’m thinking some sunbutter (sunflower seed butter) might work. It has a mild/neutral flavor like the cashew butter and just about the same consistency. If you use cocoa butter instead of coconut oil it sets well when cooled and doesn’t melt. I also used raw vegan chocolate to make cute heart shaped chocolates in moulds. So pretty! Hi Leah! Wow..I sure didn’t know that about the coconut butter. I actually have some but have always used the coconut oil out of habit. I saw all the cute chocolate molds they have at Amazon and have a couple picked out on my wish list to buy the next time I place an order. The heart ones would be really cute with the strawberry center! Ok, now I just made these and they are amazing too!!!! My daughter is 26 months and has never had any sweets of any kind other than her two bday cakes which i made myself. I’m actually dreading watching her eat a candy bar which is pretty much inevitable at some point. It’s encouraging to know I can make her treats like these in hopes of training her taste buds to like the healthy homemade stuff. Thank you so much for the recipe! Hi Jamie! 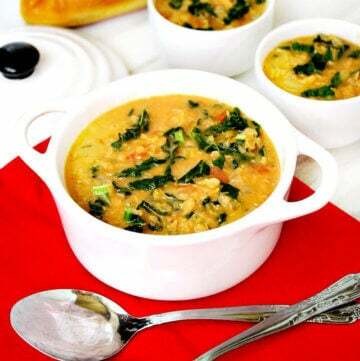 I’m so glad you tried the recipe and liked it! I did the exact same thing with my oldest son! He did not eat anything with refined/processed sugar until he was 3 years old, and then only sparingly on special occasions. Now, I make all their snacks and treats at home myself so I have control over the ingredients. 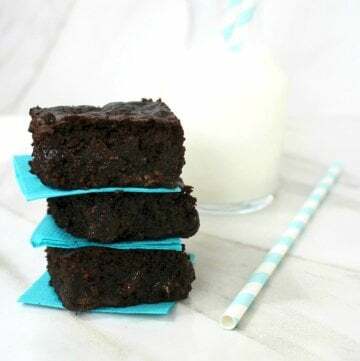 I don’t deprive them of “sweet treats”, I just make healthier, homemade versions with quality ingredients. And, the natural sweeteners (raw honey, maple syrup, dates) have health benefits when eaten in moderation. For me, I was a huge sugar addict before changing my eating habits and since I’ve eliminated processed sugars from my diet, I cannot stand anything too sweet anymore. It’s amazing once you get that toxic processed sugar out of your system how your body actually rejects it (or at least in my case). Even better, starting our children off right so they don’t have the cravings and have to break the sugar addiction later in life.